2018 was a transition year for the Beef Cattle Research Council (BCRC) in terms of both funding and program administration. An increase in the Canadian Beef Cattle Check-Off from $1 to $2.50 per head in most provinces and revised allocations to research has grown the BCRC’s research budget from approximately 15 cents to approximately 75 cents per head. 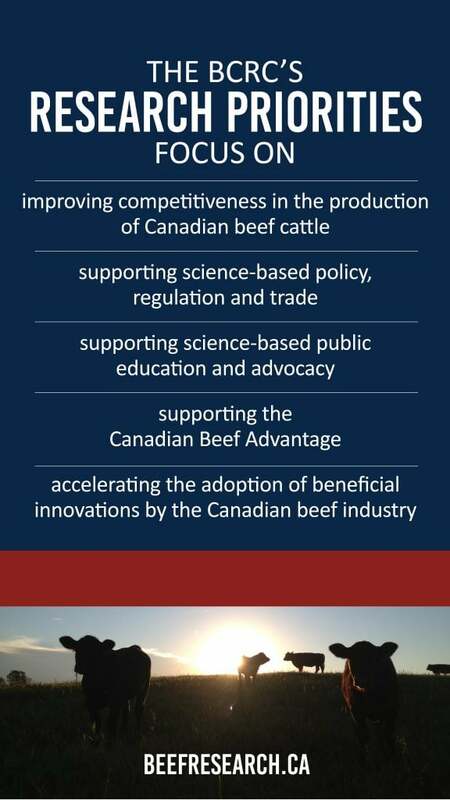 In addition, the Beef Science Cluster II, under Agriculture and Agri-Food Canada’s AgriInnovation Program, wrapped up March 31, 2018 and the Beef Science Cluster III program, under the Canadian Agricultural Partnership (CAP), has begun. The Science Clusters are a partnership with Agriculture and Agri-Food Canada that combines their strengths (including funding levels) and the BCRC’s strengths (including understanding of industry’s priorities) to make wise joint-investments in a variety of research programs with the greatest potential to advance the industry. 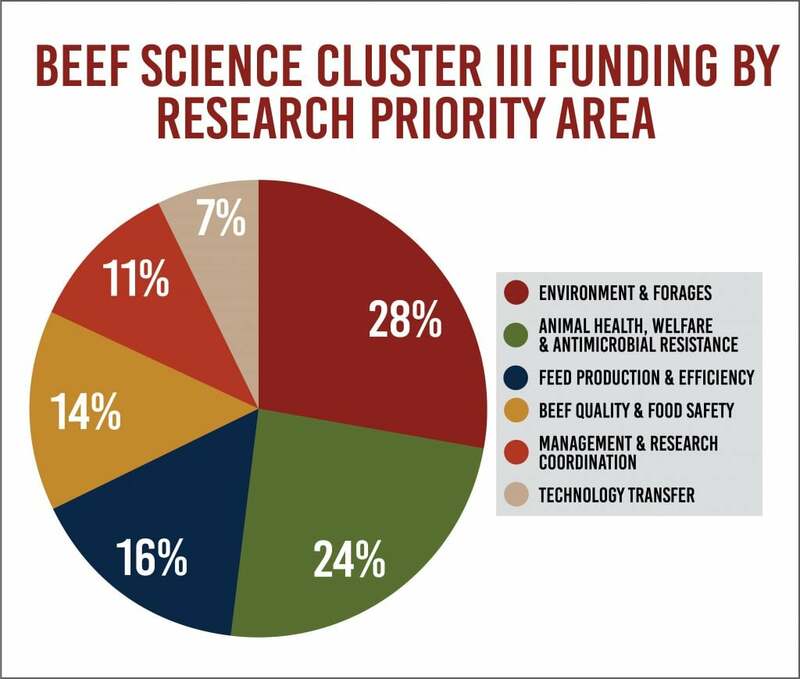 The first Beef Cattle Industry Science Cluster directed $10.5 million to 32 research projects between 2009 and 2013. Joint industry and government commitments to the second Cluster (April 1, 2013 – March 31, 2018) totaled $20 million, including $14 million in funding from AAFC, $1 million in provincial government investments, and $5 million in funding from the research allocation of the Canadian Beef Cattle Check-Off and provincial beef industry groups. Funding was directed to 26 research projects. A factual understanding of the Canadian beef industry’s environmental footprint. In 2011, producing each kg of Canadian beef required 29% less breeding stock, 27% fewer slaughter cattle and 24% less land, used 17% less water, and produced 15% less greenhouse gases than in 1981. Optimal combinations of annual forage crops, agronomic management and grazing practices that improve forage productivity while providing economical and nutritionally appropriate winter feed for the cow herd. Cost-effective, practical ways to manage the pain associated with castration in beef calves. The adoption by producers of pain control for castration has increased significantly in recent years. A report on the changes in Canadian beef quality and consumer satisfaction over time. Attributes of quality and satisfaction have remained stable or slightly improved over the past 5 years. An understanding of the occurrence and severity of beef carcass defects to inform prevention strategies. Total losses due to carcass quality defects are approximately $200 million/year. Some defects, like bruises and horns, are becoming less common while others, like excess weight, fat, tag, liver health and injection site lesions require further investigation of nutritional and health management strategies to reduce losses. New feed grain and forage varieties with superior yield and quality, including ten barley varieties approved for registration, and several lines of native plant materials, legumes, grasses and triticale with potential for commercialization. Dry chilling methods to cost-effectively control microbiological growth on carcasses in small abattoirs. The establishment of a veterinary and producer surveillance network to gather information on the prevalence of production limiting diseases and evaluate the adoption of and producer attitudes towards various management practices such as antimicrobial use, animal welfare practices and biosecurity practices. Detailed metagenomic analysis of microbiological samples collected throughout cattle environments, soils, wetlands, rivers, municipal water, retail beef, human patients and sewage samples found no link between the use of antimicrobials in beef cattle and antimicrobial resistance in humans. Funding for the third Cluster was announced by AAFC in July 2018. Covering the period to March 31, 2023, $21 million will be directed to 26 research projects. The funding includes $14 million from AAFC, $5 million in funding from the research allocation of the Canadian Beef Cattle Check-Off and $1.5 million in in-kind contributions from industry in the form of cattle, equipment, and materials. This Cluster will work to grow beef exports and supply growing global beef demand by supporting research and technology transfer that advances Canadian beef and forage production while enhancing industry competitiveness and the public’s trust in responsible production. strengthen awareness and adoption of research results via the BCRC’s innovative knowledge translation and transfer team. Details on all 26 Cluster III projects are available on BeefResearch.ca. Priority Research Projects: Increased funding will be allocated to research aimed at achieving specific outcomes related to beef quality, food safety, feed grain production, forage production and utilization, improved feed efficiency at both cow-calf and feedlot levels, and production-related priorities in the areas of animal health and welfare and antimicrobial resistance and use. The council launched a call for letters of intent in June 2018. Funding decisions on proposed projects will be made in February 2019. Summaries will be available on BeefResearch.ca. Research Capacity: Increased funding is enabling the reinvigoration of research programming in areas where research expertise has declined in Canada, such as beef production, and forage breeding, agronomy, and utilization. Many research funding agencies are limited in their ability to fund new research positions; the BCRC has the flexibility to fund this type of initiative and is looking to leverage producer investments with Institutional and Government funding opportunities that exist. The council launched a call for proposals for Research Chairs in August 2018. An announcement will be made in 2019. Knowledge and Technology Transfer: The BCRC continues to advance the implementation of its Knowledge Dissemination and Technology Transfer Strategy to drive broad and timely uptake of research results. Focus has been placed on developing and utilizing a Canadian Beef Technology Transfer Network to support the regionally limited, underfunded, and fragmented nature of beef extension across Canada. The BCRC is working to develop collaborative extension projects that bring together the expertise and resources of various groups in order to develop excellent extension resources together. Investments are also being made in economic-based decision-making tools and resources to help producers evaluate the relevance of adopting particular innovations on their operations. Advancement of the Verified Beef Production Plus program: In addition to funding research, the BCRC is responsible for the delivery of the Verified Beef Production Plus (VBP+) program, which verifies on-farm practices related to food safety, animal care, biosecurity, and environment. Ongoing national industry investment will ensure the consistent delivery of the VBP+ program as it becomes a core pillar in verifying sustainable beef production in partnership with end-users. The BCRC invites and funds projects and initiatives that have the greatest potential to benefit the sustainability and competitiveness of Canada’s beef industry. The BCRC is led by a committee of beef producers who proportionally represent each province’s research allocation of the Canadian Beef Cattle Check-Off. This post was written by the Beef Cattle Research Council for the BCRC Blog, originally published January 3, 2019.